The Chateau de Servigny has a very unique and fascinating history that entails the Gallo Roman period (late BC) and the pre-Carolingian period. There are even remnants from the original building that date back to the first owner of the chateau, The Meurdrac Family of Knights, a very old noble French family and direct ancestors to the current owners the Count and Countess de Pontac. It is however the chateau’s most recent history that played an important role in European and world history. 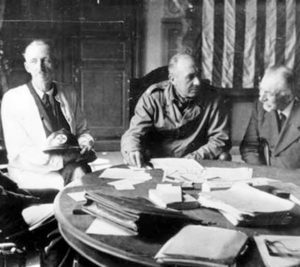 On June 26, 1944 at 4pm the only peace treaty signed between the Germans and Americans at the end of World War II, The Surrender of Cherbourg was signed by General Karl Wilhelm von Schlieben and General Joseph Lawton Collins on the bureau of the Drawing Room in the chateau. This is how the chateau was given it’s prestigious nickname of the D’Day Chateau. 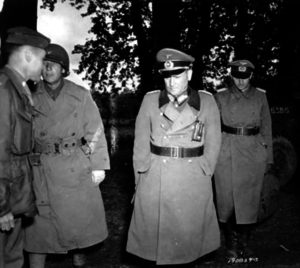 On June 19, 1944 General Karl Wilhelm von Schlieben took command of the German forces in Cotentin. The peninsula was defended by the 709th Infantry Division the stronger unit, by elements of three other weakened units, and by a part of the 77th Division that came from Brittany and had been split up by the cut of the Cotentin. The American forces attacked with three full strength divisions. The Americans pierced west of Montebourg while the Germans under cover of the rain retreated on the axis Valognes-Quettehou. The following day on June 20, 1944, the 79th American Infantry Division was in front of Valognes, and skirted round the city by the west. Yvetot-Bocage was liberated. On June 21, 1944, patrols of the 4th Infantry Division discovered Valognes was cleared from enemy forces. The fortress of Cherbourg surrendered on June 26, 1944. General von Schlieben and admiral Hennecke were taken to the Chateau of Servigny near Yvetot-Bocage where General Collins set up his headquarters. 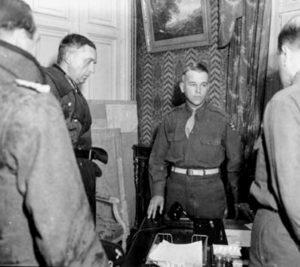 On June 26, 1944 at 4pm, The Surrender of Cherbourg, the only peace treaty signed during WWII, was signed by the American General Joseph Lawton Collins and the German General Karl Wilhelm Von Schlieben in the drawing room of the Chateau de Servigny.